Winmate has responded to the demand for capacitive multi-touch screens that can be used in inclement weather, while wearing gloves, or when using a stylus with a new 13.3" Rugged Tablet featuring three touch modes. Since standard P-Cap touch doesn't work with water present on the screen, Winmate's multi-touch tablets feature rain mode which switches to a different type of capacitive recognition that is not affected by the presence of water and allows users to continue working in wet environments and inclement weather. This Hand / Rain mode is the default mode. Wearing gloves - a standard part of many users' attire - can be a challenge with most devices, but not with the new Winmate multi-touch tablets. 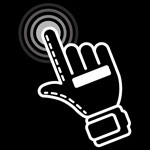 The glove mode works not only with thin gloves like some inferior devices, but also with heavy work-gloves. 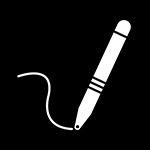 The new Winmate multi-touch tablets include a stylus with a precise 3.5mm tip. This improves ease of use allowing the user precise operations when working within the confines of the legacy Windows platform which was not designed for use with touch use hardware. In addition to a multi-touch projected capacitive screen, the M133W's features a large 13.3-inch sunlight-readable IPS display was thoughtfully designed to retain sharpness with full 1920 x 1080 pixel HD resolution and rapid processing power with Intel's latest 5th generation "Broadwell" Core i5-5200U processor. Weighing less than a laptop at 5.3 pounds (approx. 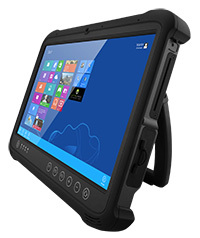 2.4 kilograms), the M133W delivers lightweight mobility in a rugged tablet. It is also equipped with a hot-swap battery for uninterrupted operation, and features robust data capture with 1D/2D barcode and HF RFID readers, as well as a 2.0MP front camera for conferencing and a 5.0MP rear camera for additional data capture. Protected against water, extreme temperatures, shock and dust, the M133W is a highly durable solution for use in even the most challenging environments. It is sealed to IP65 and meets MIL-STD-810G standards for shock, vibration, 4-foot drops to concrete, and functionality in extreme temperatures ranging from 14 to 140 degrees Fahrenheit (-10°C to 50°C). The M133W also enables connectivity and reliable wireless communication with 802.11 a/b/g/n Wi-Fi, Bluetooth 4.0, options for 3G or 4G LTE ready to operate on any carrier, and a highly accurate u-blox GPS. It ships standard with Windows® Embedded 8.1 Industry Pro or Winodws 10 IoT Enterprise operating system and a 128GB drive to support requirements in industrial applications.